Donna was born and raised in the Dayton Ohio area. Her family has always enjoyed celebrating birthdays in traditional ways. But as the family has grown with marriages and grandchildren, getting everyone together several times a year has become more and more challenging. 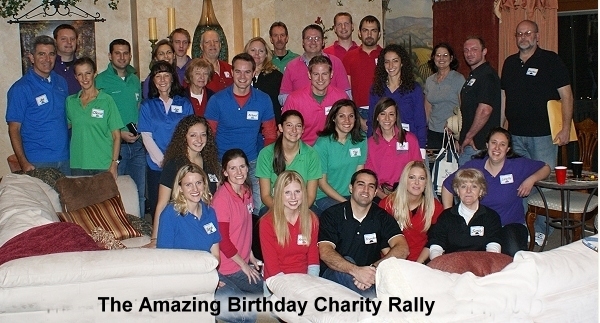 So Donna came up with an idea to celebrate all the birthdays from the last half of the year on one occasion, and to turn it into a charity event she named, "The Amazing Birthday Charity Rally." So on Saturday night, November 14, 30 family members gathered at 6 pm, put on team-colored tee-shirts, and received their packets and instructions. Each team had cameras to film their events that were shown at the end of the party. The stops were scheduled in a staggered fashion so they wouldn't all show up at the same place at the same time. By 7 pm, the cars were on the road! The 6 "rally stops" included some dress-up silliness and fun, but also some service activities, interviewing police and firefighters, and a major stop at the local Kroger store where they purchased groceries for the Food Bank. 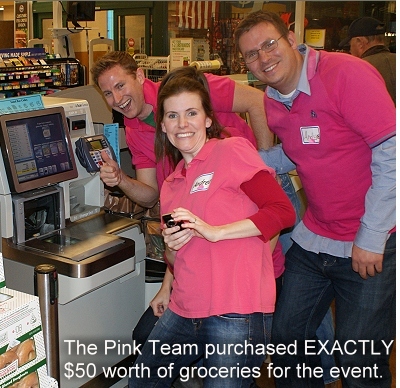 The goal of each car was to purchase as close to $50 worth of food as possible. All the groups were within a few cents of that target, and one of the groups hit it right on the penny! The teams earned extra points if they got strangers to join in the activities which made for some fun filming. 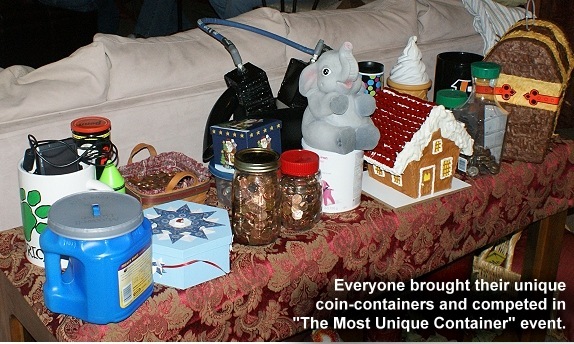 Each person also brought all the loose change from their homes and competed for the "most unique container" prize. The winner was a replica of a 2-cylinder engine with spark plugs and exhaust ports! During the rally, they dropped the coins into a Spiral Wishing Well coin funnel at the Kroger store. Along with the money tossed in by customers over the weekend, the total collected was $591.26. The Well was provided by Mike Peebles, a local realtor. 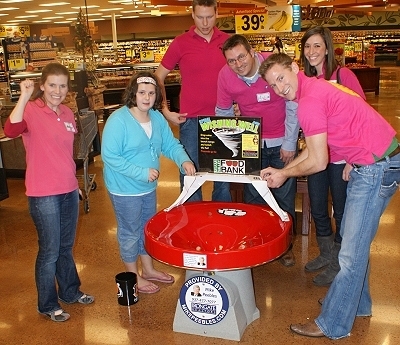 The Kroger manager said, "We are very glad to host a Spiral Wishing Well to help raise money for the local Food Bank. It is fun to watch the parents and children being fascinated by the spinning coins. Our employees loved it too. Thank you for including Kroger in your charity birthday rally, and for gathering up $300 worth of groceries. The Food Bank just told me last week that they are really having a hard time supplying enough food in this tough economic period. So the timing of your event was great." Donna reports that it was fun for everyone, and it provided an opportunity for families to get their young children involved in helping a charity. What if families in every town did this? The average home in America has $50 worth of coins in jars, under seat cushions, and in laundry rooms. Every week, there are an average of 5,890,775 birthdays in America , and birthdays are the number one reason people celebrate. With a "charity birthday" emphasis, these kinds of events could raise untold millions of dollars and food for those in need. 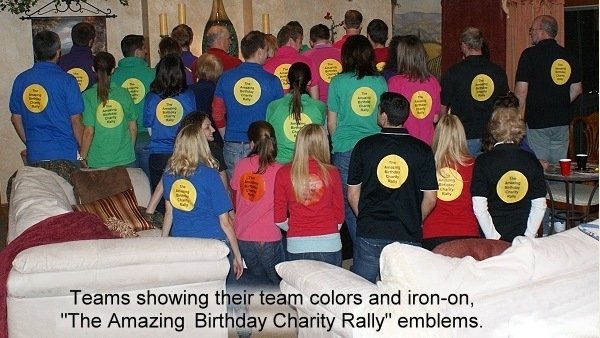 As you plan your holiday parties and future birthday parties, give some thought to focusing on a charity theme. Your generosity will make a HUGE difference for families that are struggling in these tough times. Click here to see more promotion and event ideas that have resulted in thousands of dollars per event.